Alumni and alumnae of Vassar's rowing program are mobilizing to take action in response to the announcement that the varsity men's and women's teams are being cut. In an email to administration, coaches, and current and former team members, former captain John Gregory '04 stresses the importance of the program, calling it "the most fortifying and formative experience of my life." "It is not only a dire misstep for the institution, but also a personal affront to the hundreds of dedicated, strong-hearted individuals who have endured sleep-deprived, ice-cold Hudson River mornings to achieve incredible, inhuman feats of strength in the name of Vassar," John writes. He continues: "The experience that I and my teammates shared is priceless in the truest sense of the word. 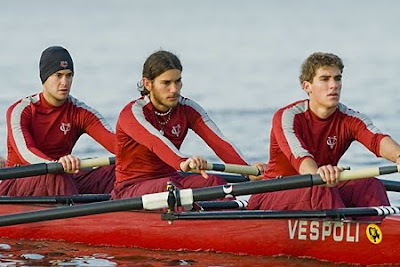 I absolutely cannot understand casting up the rowing team as a sacrificial lamb in this time of economic downturn. It is a weak solution and sincerely makes me question the leadership of the college." In addition to personal anecdotes from his rowing days, John lists the advantages that come with having the teams, including exposure for the school name and the good it does for individual athletes. We're told to expect more of a response from alums in the coming days. Check back! I'm a current member of the Rowing team (abroad this semester), and I'm infuriated that the Dept of Athletics would do this to us. Cutting the team altogether is a cop-out. It's cheep, and they should feel ashamed for not fighting for us. I hope a much better solution to the economic downturn can be found.